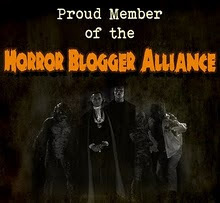 Synopsis: Nathanial Billings (Boris Karloff) is a wigged-out professor who owns a dilapidated colonial inn. 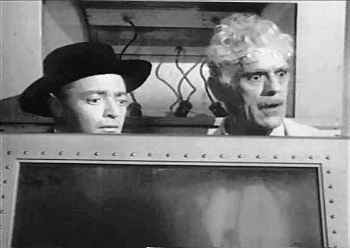 Billings carries out unorthodox experiments in the basement of the house, much to the consternation of the town mayor / sheriff / banker / justice of the peace Dr. Lorencz (Peter Lorre). Billings is paying a usurious interest rate on the mortgage and for this reason is eager to sell. The only hitch is that nobody would want the place -- it is in desperate need of maintenance and is quite off the beaten track. His prayers are answered when young divorcee Winnie Slade (Miss Jeff Donnell) shows up at the inn with the determination to buy it and restore it to its former approximation of glory. Billings gets her to agree to let him stay on for a time and work on his experiments in the basement. The nature of his experiments quickly becomes clear to us. Billings is a patriotic fellow, and he wants to do his part for the war effort. He believes he is closing in on a method of making ordinary men into super-soldiers. Alas, none of the door-to-door salesmen he's used as guinea pigs have become super-soldiers. In fact, none of them have survived the treatment. So there is a growing stack of dead salesmen in the basement, which he is desperately trying to hide. Soon Winnie's ex-husband (Larry Park) shows up and immediately becomes suspicious of the goings-on around the house, Dr. Lorencz becomes an unlikely backer in Dr. Billing's experiments, and a new dopey door-to-door salesman ( "Slapsie" Maxie Rosenbloom) becomes the latest chump hoping to be converted to a superman. 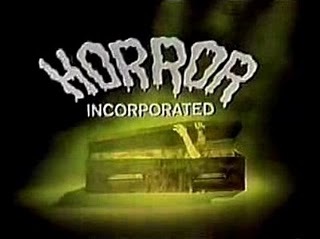 Comments: This is the first madcap comedy we've seen on Horror Incorporated, and it's a movie so tethered to one locale that it looks as though it was originally written for the stage -- even though the credits indicate that it's an original screenplay. And while I knew I'd never seen it before, why did The Boogie Man Will Get You seem so familiar to me? I finally figured it out, and no doubt you have already done so as well: The Boogie Man Will Get You is a pretty blatant knockoff of Arsenic and Old Lace, which was a popular Broadway show at the time. 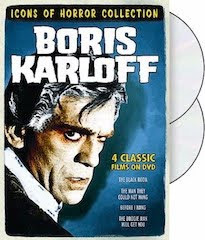 Karloff himself had originated the role of Jonathan Brewster on stage the previous year. Instead of two dotty but lovable aunts collecting dead bodies in the cellar of their boarding house, we have a dotty but lovable scientist storing dead bodies in the cellar of his inn. As you've probably already guessed, this is about as much a horror movie as Arsenic and Old Lace was. It seems to have slipped into the Son of Shock! package more or less by accident (perhaps the title and the presence of Karloff and Peter Lorre convinced someone at Screen Gems that it was a horror flick). So we must shrug for the moment and go along with it. Karloff is perfectly serviceable in the absent-minded professor role, and Peter Lorre in particular seems to be enjoying himself as the kooky and amoral Dr. Lorencz. Retired boxer "Slapsy" Maxie Rosenbloom gets in some laughs as an unsuccessful cosmetics salesman. And Jeff Donnell (here credited as "Miss Jeff Donnell") shines in her too-brief screen appearance. Considered too plain-looking to be a romantic lead (at least by Hollywood standards), her career sputtered out too quickly.... though I suspect any agent who let her use the stage name "Jeff" might not have been acting in her best interests. Nah. Sorry, I got nothin'. Look, what do I know? Maybe you'll like it. Proceed with caution. 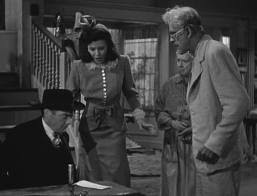 Last and least in Karloff's 5 picture Columbia contract, all of which were part of SON OF SHOCK. Peter Lorre is the real standout here, while the last time I saw Jeff Donnell was on KOLCHAK:THE NIGHT STALKER, "The Knightly Murders." Like Nina Foch, she was a contract player who did most of the studio's myriad series films of the decade- THE WHISTLER, BOSTON BLACKIE, THE LONE WOLF, CRIME DOCTOR, I LOVE A MYSTERY. THE BOOGIE MAN WILL GET YOU aired twice on CHILLER THEATER in the late 60's. I didn't know Jeff Donnell did a guest shot on Kolchak: The Night Stalker. (Don't remember that particular episode; I will go back and watch it though). Thanks for the tip! Jeff Donnell appeared with Robert Emhardt as a coat of arms dealer trying to sell one to Kolchak- The Lion of Warsaw! (he bought it). We never see the face of the 12th century Black Knight, but Hans Conreid plays the curator, and John Dehner is an introspective police captain.